Real Adventures Pub. Co., Inc., 1948. 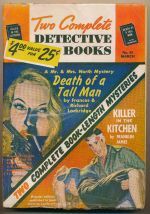 Contains 'Death of a tall man' by Frances and Richard Lockridge, and 'Killer in the kitchen' by Franklin James.